Star Wars: The Force Awakens' poster is finally here! During Disney's D23 Expo yesterday, the poster was revealed. However, it is not the official poster, just a commemorative poster for the D23 Expo. The poster is by artist Drew Struzan, who is known for his work on the Star Wars Original Trilogy and Indiana Jones posters. Even though it is not the official poster, it is a little strange in how large the characters are proportionally to everything else. 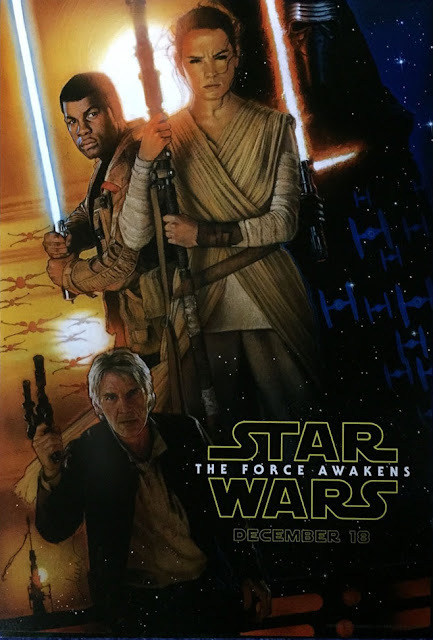 Han Solo also looks a little strange and out of place, but the Light vs. Dark Side aspect is classic Star Wars. Overall, not a bad poster considering that it is not the official one. What do you think of the poster? Please comment below and check back tomorrow for news from the D23 Expo.